Go to mikes beach apartments on the beach behind captains table restaurant. Half the price and everything works. Very nice rooms, big, clean pool, nice breakfast, recomended for all. •The hotel is very isolated from other hotels and restaurants. At least a 5 minute walk to the beach which itself wasn’t fantastic, very rocky and full of seaweed. Another 15-20 minute walk to get to any form of a decent Greek restaurant and a further 30 minute walk to get to the nearest sandy, clear water beach. •You will most likely need to pay for taxis or hire a car/moped/quad to reduce these distances. •Parts of beach are occupied by other hotels, therefore you won’t be able to use their sun chairs. •Not a resort I would recommend to people around our age (21/22 years). No form of nightlife at all and absolutely nothing to do in the day. Hersonossis as a resort was very good. We walked on a few occasions from our hotel into resort center and saw several areas that would appeal to all age ranges namely, lovely secluded beaches,water park areas for young children, music areas for teens and a shoppers paradise with restaurants serving gorgeous food. Beaches we went to were great very secluded and very clean. We were between Hersonnisos and Stalis. Hersonnisos beach not great for kids as it had a deep shelf into the sea about a metre out. Stalis beach better nice and clean lots of sunbeds/shades 4 euros for 2 per day and it was a safe beach- if not windy. Heronsonissos Local resturants fantastic, fresh fish caught in morning on plate by evening. Try Captain Jacks and Albi's. Small harbour also short walk away lovely boat trips available.Glass bottom boats a bit of a let down no fish but swimming from them bliss. Go to Spinalonga for a good day out and please don't miss the Jeep Safari with safariclub.gr this is what land drovers were made for say hi to Brian and crew..and hold on tight. There is more than enough for everyone to do here. If you wish to be in the middle of everything then Hersonnissoss is for you. The beach is big enough for you to find a space to yourself or just use the beds that are available. Bars and shops along beachfront. Anissaras is the quieter side of life if you want it. There are a few beaches you can visit, one which is around a 20 minute walk. Another is at "Star Beach" which you can get to on the bus, this beach is lovely and here you can take part in water sports and visit a water park. At Star Beach there is also foam parties, bars and restaurants. In the main town, Hersonnisos there are lots of bars and restaurants, many of these being on the beach front. we are visiting here again very soon! The beach was nice ..clean ,shingle & sand .part of the beach was free but the nicest part was 6 euros.some nice bars ,basic ,friendly.Captains Bar was the best. Nice town centre with everything you need a good selection of Taverna's, Bars,Restaurants,Clubs & Shops, the beach we visited was a bit crowded but clean. Buses run at frequent times along the main coast road so was easy to visit other resorts and taxi's were cheap for the other area's not served by buses. The Aquapark in Hersonissos was great day out and reasonably priced at 20euro per adult. 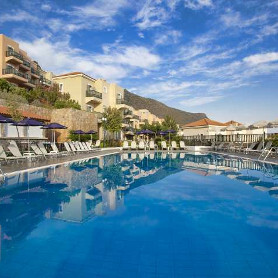 We have just returned home from our holiday 12-25 May in Hersonissos,Crete, and found it to be a clean resort. We didn't seek entertainment and found all we needed at our apartments. Beach was clean and the scenery was stunning with loads of taverna's along the route serving lovely meals and the much needed cold drinks. Yes we would like to and will recommend it to our friends & family.